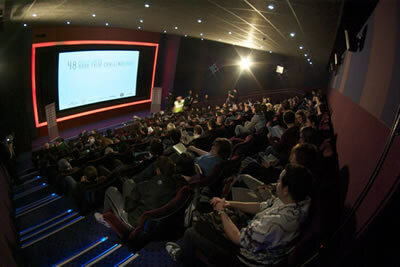 77 teams left the venue armed with their titles, props and dialogue to make a 5 minute short film! 55 Films returned on Monday, well done to all those who made it - commiserations to those who couldn't get their films complete in the time. Films available to watch on the SCI FI Channel's website soon. Online registration is now closed - you can still take part by just turning up at the Apollo Piccadily Circus at 11.30am on Sat 4th April. We are also delighted to confirm prizes from Canon and Adobe. The winning team will take home a Canon Legria HV40 Hi-def camcorder and a copy PRODUCTION PREMIUM from Adobe. Two runners up will get Premiere Pro - this is on top of the other neat stuff we have. CAN YOU MAKE A FILM IN 2 DAYS? Use your creative circuits, wit and talent to make a short film and you could win some neat prizes (including a X-box from Ea, subscriptions, cash, kit, software etc), let alone kudos from our jury - headed by legend Marc Caro - the festival and of course our audience. Why? Well, winning films will be premiered at the festival! Our film challenge is FREE TO ENTER - well, it seems wrong to ask you for money, you will be working hard enough as it is! It's really easy. We'll give you a randomly generated film title, some dialogue and maybe a prop list. You'll then have 48 hours to write, shoot and edit a complete five minute film... hard work but fun! IT IS FREE TO TAKE PART - you just need to have your own kit. At 11.30am sharp on Saturday 4th April 2009, one person from your team must attend the launch at the Apollo West End where you will be given your brief. Participating teams then have just 48 hours to write, shoot and edit a short science fiction film to be no longer than five minutes including credits. You can be a team of one if you want but we recommend five or six people (Director, Lights, Sound, Editor, Camera and someone to fetch coffee, keep everyone fed and general be indispensable!). To make things more interesting, teams may be given a style or sub-genre (sf/horror, time travel, superhero, genetics etc.) and some will also be given a character or a prop (which they may need to source!) and some dialogue that must be said by someone in the film - you won't know until the day.. Teams are accepted on a first come first served basis and remember, we do not give you any kit to shoot or edit your film. Did we mention our jury? All creativity must occur within the competition period: writing, rehearsing, shooting, editing, graphics, sound design, etc. Get your film to the Apollo by 1pm on Monday and you're in the competition! No materials will be returned so don't give us the only copy! By entering you agree to give us non-exclusive, worldwide rights to the film, forever and we can do what we like with it - forever! All films returned by 1pm on Monday 6th April, no shorter than 3 minutes and no longer than 5 minutes, copyright cleared and containing all the random elements issued on the previous Saturday are eligible for judging. The judges decision is final - really, no arguments! Use of a time machine or other similar instrument to stop the normal passage of time, giving you say 3 weeks to make a film in what seems like just a weekend to the rest of us - well, that is cheating and we won't stand for it - unless of course you use some kind of mind control and erase any knowledge of this rule or your cheating or the fact that the time machine was invented. The top 10 shortlisted films will be streamed exclusively on the Sci-Fi Channel's website for one month! Registration is now closed - good luck all those taking part. Want an example of what can be done in just 48hours? Remember science fiction film does not need to be set in space, have lots of special effects or CG. In the meantime, you could also enter the DANTE'S INFERNO Game Trailer competition in association with EA. The winner will feature at the festival and also get a trip to San Francisco! StarNow - Find an Actor for your film.